Photo: Leo J. Cary House, ca. 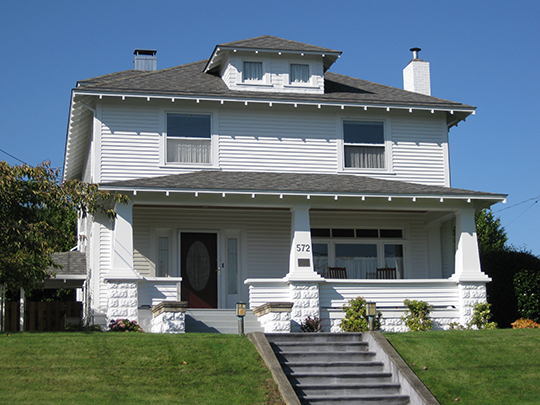 1912, 572 East First Street, Coquille, OR. Listed on the National Register of Historic Places in 1992. Photographed by UserZenhaus (own work), 2012, [cc-by-3.0 (creativecommons.org/licenses/by/3.0)], via Wikimedia Commons, accessed February, 2014. The Coos County Courthouse is located at 250 North Baxter Street, Coquille, OR 97423; phone: 541-396-3121. Exploration of the area that would become the county began as early as 1828. The county was created in 1853 with Empire City as the county seat. The seat of government was moved to Coquille in 1896.